I do enjoy a wonderfully seared thick cut of marbled beef as much as the next gentleman, but I also fancy lighter fare from time to time. Beets & goat cheese is a classic combination and for good reason. It’s always been one I’ve enjoyed very much. With this dish, I wanted to play around the with form factor of a classic, and get away from the large diced roasted beets I’ve become accustomed to; in addition, to create something that appeared delicate, yet imparted considerable flavor. The first thing was to address the beets themselves, and how to utilize them in an interesting way. Pickled beets aren’t exactly a new creation, but in their typical form I find they can drown out your palate fairly quickly. The first thing was to shave the beets finely on a mandoline, this created the backbone of the presentation, but also prevented their flavor from becoming overly intrusive. I decided to utilize a cold pickling process to allow the beets to retain some of their crisp texture. Utilizing different vinegars for each color of beet helped provide distinguishing flavors while also providing color retention. Oranges work beautifully with beets. Since I wasn’t roasting the beets, which coaxes their natural sugars out, the addition of orange added a necessary sweet note to the dish, rounding out some of earthiness from the beets. Slicing the orange into individual segments is a technique called supreme, which refers to the point that you’re only taking the best part of an ingredient. By removing all of the bitter pith, and any membrane or seeds, you’re left with a wonderfully meaty segment of fruit. I adore the combination of fennel & orange, and figured if oranges & beets played well together, why not gather all three collectively for a playdate? So I toasted up some fennel seed and crushed it in my mortar & pestle to provide the plate with some toasty contrast. To keep things light and airy, I chose to craft the goat cheese into a mousse by whipping it with a little heavy cream. While the mousse comes off as a somewhat sophisticated yet unnecessary addition to the plate, it helps tame some of the assertiveness that some people don’t enjoy with goat cheese. Chive bâtonnets contributed a pop of contrasting color and some straight lines to the final presentation, and along with some minced shallots added a subtle allium flavor to the dish. The breezy nature of this salad delights with its palette of colors and textures. The earthy crisp beets are brought to life with the sweetness of orange segments, while the goat cheese mousse serves up a lush tangy note to the final dish. Toasted fennel seeds add an aromatic quality, while shallots along with chives offer a spicy pungent flavor. All of this is rounded out with a drizzle of mellow extra virgin olive oil. A rendition of classic combinations, for me, this dish signals the dawning of spring, where grounded flavors give way to brighter tones and excitement for what’s to come. I suggest prepping out the golden beets before the red beets because they don’t stain everything like red beets do. This will prevent cross contamination, retaining the golden beets beautiful color. Place a piece of plastic wrap down on your worksurface and wear gloves to keep from cleaning up stains. Trim tail and head off the beet, and peel. Using a mandoline, slice beets into paper-thin rounds, and place into a container. Combine vinegar, water, sugar, salt and whisk until dissolved. Add the liquid mixture to your beet container. Allow to pickle for at least one hour or store in the refrigerator. Add goat cheese to a bowl and whisk to smooth out a bit. Slowly add cream to bowl and continue to whisk until mixture smooths out, adding more cream if needed. Season with salt to taste. Next, vigorously whisk mixture to incorporate air until you get a fluffy mousse like consistency. Scrape contents into a container and reserve in refrigerator. Pull beets out of container onto paper towel lined plates, making sure to continue to keep them separate. Make sure excess pickling liquid is absorbed before laying beet pedals on a plate. Dot goat cheese mousse amongst the beet pedals. 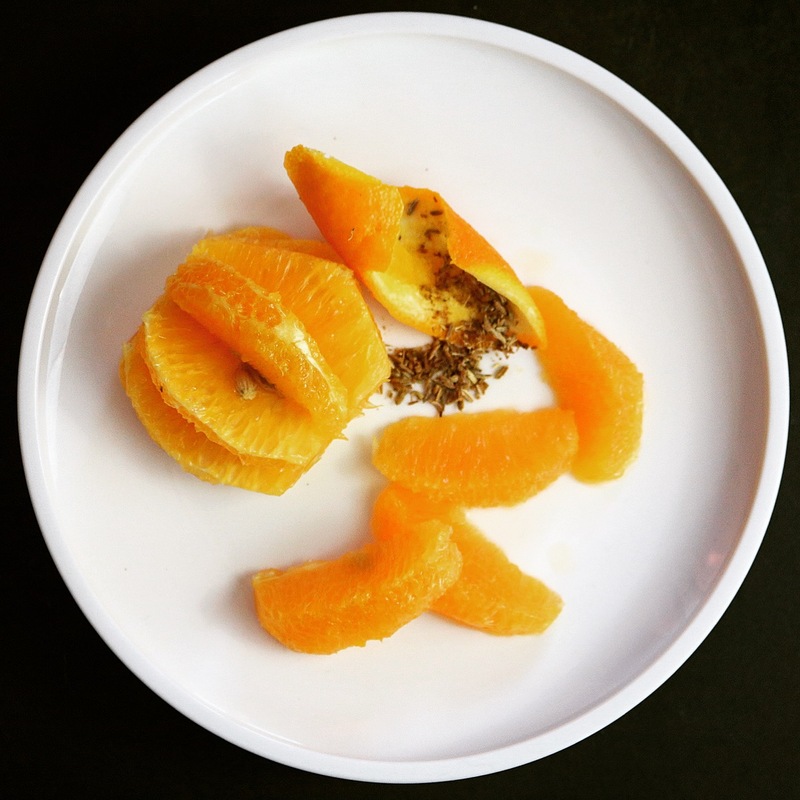 Garnish with orange supremes, chive battonetes, and minced shallot. Sprinkle on the toasted fennel seed, and season with salt & pepper. A drizzle of olive oil finishes off the stunning salad.